SOPHOMORE WRESTLING TEAM: (Row One:) Raymond Kezler, Thomas Mitchell. Kerry Erwin. Mark. Wegrzyn, Martin McHugh, Mark Darragh, John Downs, Scott Bushnell, (Row Two:) Walter Nadasdy, Mark Alberson, Chuck Detmar, R. Jansma, Ray Griggs, Kevin Erwin, Jeff Dohl, Leonard Winkler, (Row Three:) Robert Roy (mgr), Bob Yingling, Dave Turbin, David Kohlenberger, Terry Jansma, Bob Beruman, John Frigo, Coach Hamsher. 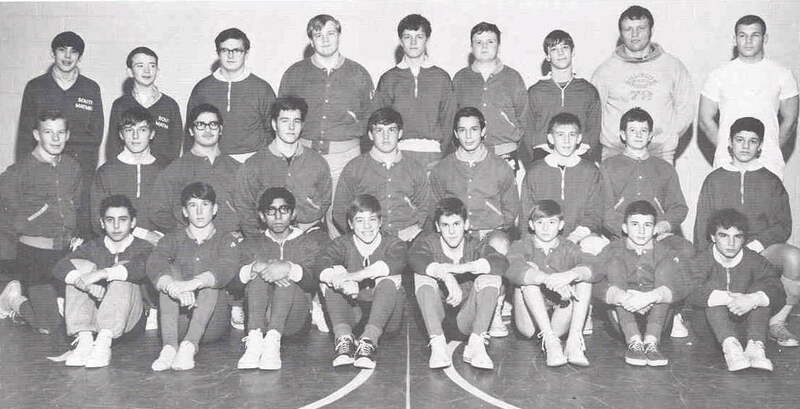 FRESHMEN WRESTLING TEAM: (Row One:) Daniel Aloia, Joseph Slattery, Dale Garcia, Ronald Swet, Michael Armstrong, Glenn Sinkus, Gall Anderson, Mark Lauerman, (Row Two:) Charles Cotterell, J. Boksa, Tom Kilheeny, Mark Wallace, Dave Matz, J. Ganey, James Varner, Gary Steere, B. Necastro. (Row Three:) Keith McWilliams, G. McCue, Robert Whitehead, Mike Finchum, Richard Davis, Jeff Chockly, Roy Carr, Coach Cromwell. Coach Kerns.